Milltown, WI – Nine martial arts instructors from across the USA will face off in a friendly competition Nov. 16-30 as they vie for the title of 2017 Greatmats National Martial Arts Instructor of the Year. 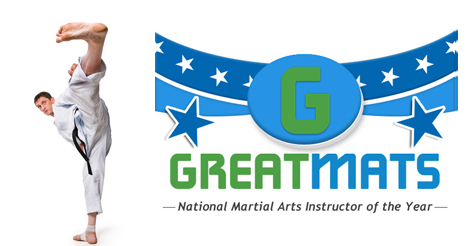 The contest, in its second year, is part of Greatmats 3rd Annual National Awards Series which honors instructors who have made positive impacts in their communities. The winner of the award will receive his/her choice of martial art mats or a cash option for his/her respective academy. The public will have the opportunity to choose the two finalists for the award via a two-week social media vote on Greatmats Facebook page, starting Nov. 16. Approximately 200 competitors will be swarming to Huntley, Illinois, on Saturday, May 7, for the 35th annual American Kyuki-Do Federation Spring Tournament of Champions and Black Belt Promotion. As a family-based martial arts federation, the much-anticipated AKF tournament will feature martial artists, ranging from 2 ½-year-olds, competing in the Kihap Contest, to 4th Dans going for the gold in weapons, breaking, forms, grappling and sparring competitions. At least 13 academies and three states will be represented at this year’s Tournament of Champions which will be coinciding with its Spring Black Belt Promotion for the first time ever. In previous years, the black belt promotion has taken place the day following the tournament, but due to the events falling on Mother’s Day weekend this year, the two events have been combined into one power-packed day. Festivities begin at 8 a.m. at: Huntley Park District, 12015 Mill Street, Huntley, IL 60142. Also new in the 35th year of the tournament is AKF’s partnership with martial arts flooring provider Greatmats, which is offering all competitors and spectators in attendance the opportunity to participate in Greatmats Photobomb Contest for a chance to win either a $25 Amazon Gift Card or $50 in Greatmats Credit. The Photobomb Contest winner for the AKF Spring Tournament of Champions will be automatically entered into the Grand Prize contest for a chance to win a 5×10 foot by 2 inch folding gym mat. 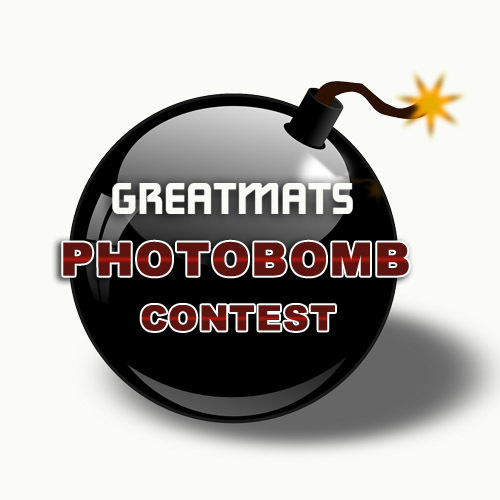 For more information on the Greatmats Photobomb Contest, visit http://www.greatmats.com/martial-arts-mats/greatmats-photobomb-contest.php. To learn more about Greatmats’ martial arts mats visit http://www.greatmats.com/martial-arts-mats.php. 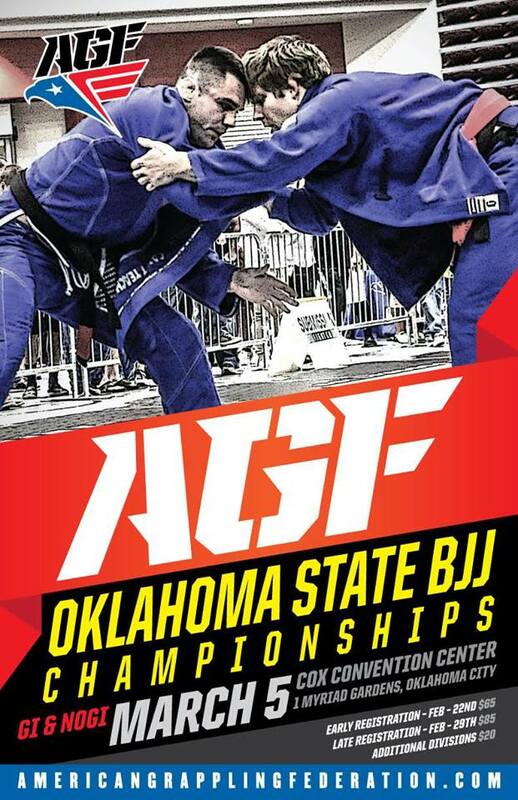 If you’re in the Oklahoma City area on March 5, you won’t want to miss the American Grappling Federation’s (AGF) Oklahoma State BJJ Championships, sponsored by Greatmats. This premiere event, in its fourth year, will feature more than 600 competitors from 113 academies. Competitors range from age 3 to 58 years young. Fighters from five of the Top 10 ranked AGF academies will be showing off their skills. Leading the charge is third-ranked BQuick JJ which boasts a team of 82 competitors. BQuick JJ is led by Sebastian Dayer who has 18 points already in 2016 and will compete in the 7-9 year-old Featherweight divisions. Fourth-ranked Lovato BJJ is the largest ranked academy with 164 competitors. Ruben Hernandez in the competitor to watch for Lovato BJJ as he has already accumulated 21 points in three competitions this year. Hernandez will compete in the 10-12 year-old ultra heavyweight divisions. His teammates, Alexia Benton and Clayton White have recorded 18 points apiece. Benton competes in the 7-9 year old middleweight divisions while White is in the 10-12-year old medium heavyweight divisions. Fifth-ranked Core Fight Academy is a small but power-packed squad of 27 competitors. Be on the lookout for Oliver Smith, who leads the team with 27 points in three competitions. Smith will compete in three classes for 10-15 year-olds under 85 pounds. Also represented are sixth-ranked academy Alliance BJJ and seventh-ranked Alvaraz BJJ. Look for plenty of great action and don’t forget to participate in Greatmats Photobomb Contest while your there for a chance to win a gift card or 5×10 foot folding mat! MILLTOWN, WISC. – Every martial artist has a different reason for taking up the sport, and a different reason for sticking with it. For some, its all about fitness. Others have an unquenchable competitive spirit. Martial Arts are commonly taught for self defense and serve some who have been bullied or fear they might be. For some its more about inner peace or camaraderie. For whatever reason, Martial Arts have long helped people cope and conquer challenges in their lives. Greatmats, a Wisconsin-based martial arts flooring leader, is seeking out inspiring martial arts stories to share how martial arts have served to help people overcome challenges. 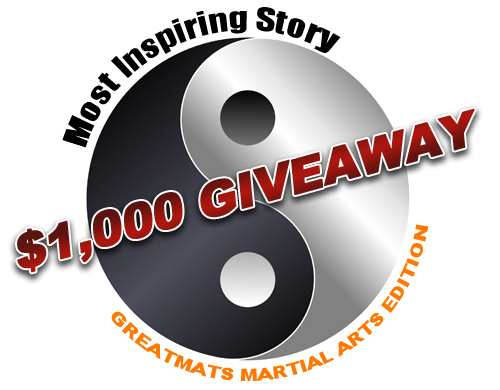 The most inspiring story will win up to $1,000 in Greatmats credit or up to $700 in cash through Greatmats’ “Most Inspiring Story $1,000 Giveaway: Martial Arts Edition”. Greatmats is accepting submissions through Jan. 10, 2016. For more details on the contest and how to enter, visit http://www.greatmats.com/gmats-giveaway.php. Now you can have the same professional-quality MMA mats for your home gym as our larger grappling mats that are used in professional MMA studios nationwide. Convenient 2×2’ interlocking puzzle mats are the same dense EVA foam material as our larger 1×1 meter mats but easier to store. Our home MMA mats are 1-5/8 inch thick with a durable tatami, no-burn surface texture just like our pro-grade larger tiles. They provide the proper amount of traction for footwork as well as ample cushion for takedowns and throws. Home MMA mats are an great choice for ground grappling technique practice and full on takedowns. They are designed specifically for the grappling arts, Judo, Jiu Jitsu, and MMA for home users. You can choose two color options: red/blue or black/gray. With these double sided and double colored home MMA mats, you can easily create a design for your home MMA practice and training space. 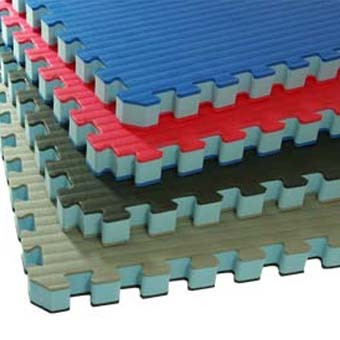 Choose our home MMA mats for BJJ practice, grappling practice or Judo and Jiu Jitsu practice. You can easily cut these MMA mats for home use to fit for a wall-to-wall installation. All you need is a sharp utility knife. These home gym mats are easy to install and can be placed directly on any hard flat surface including concrete. Our best MMA mat for home users, they are designed specifically for soft martial arts shoes and bare feet. (You should not wear combat boots on this flooring.) These mats will last many years. They are completely waterproof. Home MMA Mats can ship ground delivery directly to your door. This will save you money and time. Please note: Mats will expand with heat and humidity. Allow a 1/2 gap around the perimeter of your room to account for this so your foam flooring doesn’t swell or buckle. Allow at least 48 hours prior to installation for your mats to acclimate. Direct sunlight is not good for the mats and can cause unwanted expansion.